The Michigan Economic Development Corp. helped broker a deal to land Waymo's expansion in the state. Self-driving vehicle company Waymo plans to expand its footprint in Michigan. Company executives said Tuesday they are looking to identify a location in the southeast section of the state where they'll hire as many as 400 employees over the next five years to install its self-driving systems on vehicles produced by Fiat Chrysler Automobiles and Jaguar. 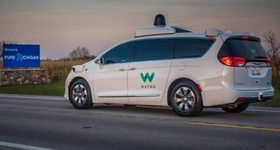 Waymo is partnering with global supplier Magna to integrate the systems on vehicles, with a team hired exclusively for the work on the Chrysler Pacifica hybrid minivans and Jaguar i-Pace electric vehicles the company plans on using as it expands autonomous operations in the years ahead. "As we begin to commercialize our business and vehicle supply grows, we're laying the foundation for a scalable, robust vehicle integration plan, starting in Michigan," the company said in a statement. Waymo plans to move into the space by the midpoint of this year, company executives said, and the program is expected to be operational by 2024. The Michigan Economic Development Corp., a public-private partnership agency that works to recruit businesses, helped broker a deal to land Waymo's expansion in the state. The company will receive an US$8 million grant from the Michigan Business Development Program that supports the first 100 jobs in the project, according to documents provided by the MEDC. Waymo is expected to make a US$13.6 million capital investment in what's expected to be as much as a 200,000-square-foot (60,960-square metre) facility, per the same documents. A Waymo spokesperson says the company would likely look to repurpose an existing space rather than develop a new facility from the ground up. Waymo already has a facility staffed with 20 employees located in Novi, which the company opened in October 2017 to house vehicles used for testing throughout snowy winters and in other adverse weather conditions. But the company's biggest on-road presence remains in and around Phoenix, Ariz. That's where Waymo runs an ongoing pilot project, in which members of its Early Rider Program can access hundreds of self-driving vehicles for ride-hailing purposes. Last month, Waymo formally kicked off Waymo One, its commercial ride-hailing business, in which those early riders can hail AVs — with human safety drivers still behind the wheel — via an app. Magna has experience designing, launching and executing vehicle programs for many automakers. The company has a similar autonomous-vehicle partnership with ride-hailing service Lyft, in which it will integrate self-driving systems on fully autonomous vehicles for Lyft. Roughly 300 engineers from both companies work on that project in Palo Alto, Calif. When Waymo opens its operation with Magna later this year, it will be one of the world's first factories dedicated to the production of Level 4 autonomous vehicles — those that require no human role in the operation of the vehicle. An assembly plant operated by French autonomous shuttle-maker Navya is located in Saline, Mich., where they build vehicles and outfit them with Level 4 self-driving systems. Now Waymo, the self-driving company with more vehicles on public roads than any other competitor, is helping to entrench Michigan's role in producing vehicles of the future. "Auto manufacturing has created hundreds of thousands of jobs in the state, and built an economic engine that fuel the entire country," Waymo said in a statement. "We'll be looking for engineers, operations experts, and fleet coordinators to join our team and help assemble and deploy our self-driving cars."